We’re having six lovely people over for dinner tonight, which means that I have been frantic for about three weeks. This is nothing new. How do I clean the house, cook the food, look presentable; dust the floorboards, wash the front exterior windows, really clean the hardwood floors in the dining room, find a menu that is tasty and delicious and doable, with the right blend of flavors, textures, and colors, find the time to shower and do something with my mop of hair and remember to put on lipstick; vacuum thecobwebslivingontheceilingswipethehandprintsoffthedoorjambscleanthestainlesssteelappliances makesure iknowifanyguestsareglutenfreeorallergicorhaveastrongpreferenceagainst porkormushrooms orasparagusormakesurethedogstays outofthehouseandshouldiwear askirtorculottesoradressorpants andwhatearringsdoiwearand willanyonenoticei fimwearingmy tennishoes? I do love to have people over for dinner but we haven’t done that much lately. Or house is smaller than our last one and it gets rather cozy when more than four show up. Our seven year old tolerates a bunch of grown ups. And then there’s the puppy, who simply has not understood this week why I do not allow what’s left of Giraffe’s innards to remain in bunches strewn through the house. I love having people over and I love the fuss. Because our guests tonight are slightly older than my husband and I, I’m using the good stuff, and it’s a thank-you dinner, so I’m using the good stuff. I love using the good stuff, because the communion of saints is with me. 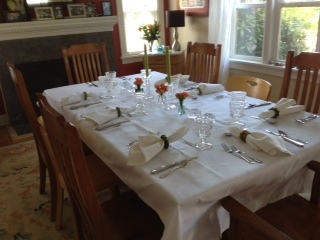 Whitney and John gave my the linen tablecloth as a wedding present. My in-laws gave us their cut glass water glasses. My parents downsized and gave me back the Waterford votives we gave them for their twenty-fifth wedding anniversary. I’m using our wedding china and crystal for dinner, and my father-in-law’s mother’s china for dessert. I love having people and I love the fuss – up to a point. I find myself teetering on the edge of Crazy, and I don’t want to fall off that particular cliff because deep down I know this really is all about hospitality. Our guest won’t care one whit if there’s a cobweb in the corner, or if one of the puppy’s chew toys is left in the bathroom. They won’t care if the wine is so-so and food lukewarm. What they will remember is if they felt welcomed, and if there was good conversation, and if we were enjoying ourselves as well. So during this day of cleaning and chopping and prepping, I’ve been thinking about communion this Sunday. I think about the women who are so great about making sure the communion cloth is centered, if there is the right number of plates and chalices. I think about them crowding into our little sacristy, laying out bread pieces and sharing their relief that it’s intinction this month and they don’t have to fill all the little juice glasses. I think about communion as hospitality, knowing that those who come for this particular holy meal probably wouldn’t notice if the tablecloth were off-center or a little stained. They wouldn’t care if they had to wait a moment while the bread plate was replenished. What they might remember was that a pastor called them by name, and offered them the bread of life and cup of blessing, and with two small tastes something inside them was sated. Of course, bread and juice is a lot simpler than pork tenderloin, wild mushroom bread pudding, roasted asparagus, and panna cotta. Once a month our congregation offers an evening service of healing and wholeness in the Taize style of worship. I attended the service for the first time last night – for the first time, not because I don’t have those to pray for who are seeking healing and wholeness, but because, really, my colleague is beautifully suited to lead that service and usually at 5:30 on a Saturday night I don’t want to be in church. But I went last night, in part so that I could experience it but also because a few of us were staying afterwards to decorate for the Pentecost service today. It was a lovely service and I’m glad I was there as it feels that there is a lot to pray about right now . So the choir is leading some of the Taize songs, and my mind wanders in a good way. I start thinking about a friend of mine who has been diagnosed with cancer, and the prognosis is so-so. I start thinking that I would like a miracle for this friend, which gets me thinking about miracles in general. Once in my life I prayed for a miracle. A very dear parishioner in the first congregation I served was in a coma. It was a cardiac thing, an utter surprise for this healthy, relatively young, fabulous, beautiful, kind woman. She lay in a coma and I stood by her bedside and prayed for a miracle, that she would come out of the coma, that they would shrink her enlarged heart, that her husband and sons would enjoy decades more with her. But the miracle didn’t happen, and eventually she died and it was awful. I haven’t prayed for a miracle since, but last night as I was thinking about my cancer-diagnosed friend, I thought about miracles again. What if there was some rule that you could only get one miracle granted in the course of your lifetime? Would I hoard it for myself or my child or my husband, save it for a rainy day? Or would I be burdened by the miracle and offer it up the first ripe opportunity, and not be weighed down by the decision of when to use it? Would I not pray for the miracle and then regret it the rest of my life? I know people who have experienced miracles. I know people who have experienced answers to prayer that they would call miraculous. I’ve only prayed for a miracle once, and it didn’t happen. And I know that should not be proof that God doesn’t grant miracles (or perform them? I’m not sure what verb to use.) But it’s hard to ask for something and get a ‘no’ and then be willing to ask again; harder to do that again and again and again. It leads to a world of disappointment and not a little bit of doubt about the good intentions of the Divine Creator. Meanwhile the choir finished their Taize song and we had moved on to other prayers. I didn’t pray for a miracle last night. Instead, I went to light a candle, for my friend, and for a few others. I added a little light in the darkness, and in that moment, that felt better than a miracle. It’s just one of those ministry days. A meeting here or there, a little pastoral care, some reading to prep for class, checking the calendar to make sure I’m not missing anything. And two encounters with homelessness that have gotten me to thinking but not drawing any conclusions. Our congregation participates in a Portland project allowing people experiencing homelessness to sleep in their cars overnight in our parking lot. It’s not a great solution; it’s a pretty terrible one, but sometimes it’s the best choice some folks have. We work with a shelter that provides a temporary “home” for families and helps them find more permanent homes, and today I met with a family that will be our parking lot guests until a space at the shelter opens. If you met these people at McDonalds or Safeway, you wouldn’t think twice about where they lay their heads at night. A mom, a dad, a rambunctious two-year-old boy, a sweet girl almost one and almost walking. They were on their way to renting-to-own a house; turns out it was a swindle, and they lost all their money. They’ve been sleeping in their car for six weeks. They go camping when they can so they can stretch out in their tent and let the kids run around outside. Mom and Dad are the biological parents of both kids. He’s had the same swing-shift job for three years. She is well-spoken and a very attentive and patient mother, taking classes. And they call their Xterra home, at least for now. We’ll provide them with a porta-potty, a designated parking space, access to showers and laundry, and prayers. And probably some diapers and gas cards and cookies, if I know my congregation. This afternoon I was waiting outside the church entrance with the parents and some of the kids in our children’s choir. They are on their way to the local university to be real-live subjects for college kids studying to be music teachers. It’s become an annual outing, and the kids love it. Riding light rail, going to college, performing for young adults, plus pizza and a movie at the end. Woo hoo! Good times. So we’re outside waiting when a man who is obviously homeless starts coming down the sidewalk. “Obviously homeless” – that’s telling. And judgmental of me. And descriptive. He had scraggly facial hair, random layered clothes that were stained and too loose. Shoes that have seen more than I have in my lifetime. He had that look in his eyes that made me want to usher all the kids inside. But I’m trying to be a role model here so we stayed and acted non-anxious. He catches my eye and says something to me that I think is “what time is it?” I don’t have a watch or phone, and tell him I don’t know. He asks another mom there “what time is it?” She tells him 3:30. He says something else, and she is patient and kind and says, “I’m sorry, I don’t know.” Then he sees my husband, the co-pastor with me. He goes nose-to-nose with my husband, tricky because there is a cigarette (unlit) dangling out of his mouth. He gets a bit belligerant, and the kids notice. My husband very patiently, very calmly starts to move him along the sidewalk while the rest of us do usher the kids inside. Now my daughter is beside herself, worried that this man will punch her dad. My husband comes back; he’s fine. He comforts my daughter. The kids all want to know about his guy. What’s wrong with him? Why did he act that way? I am blessed to have great adults around. We say things like “his brain works differently” “we don’t know what he thought he was seeing” “he’s someone who needs help”. I don’t even know how to draw a lesson out of these encounters, except to say that many people wander, but not all of them are lost. But some of them are lost, and have been for a while, and it will take a lot more than cookies and kindness to help them find their way home. As I lay in bed snuggling my daughter tonight, I started thinking about people I know for whom tomorrow is going to be difficult – the mother whose daughter was just diagnosed with cancer. The husband and two daughters whose wife/mother died suddenly earlier this year. The friend whose relationship with his mother is strained because of deep-held and widely different understandings of what sin is. The mother of a preschooler and an infant who posted one of those things on Facebook this week about the utter frustration about not being able to get it all done. The mother who was first to find her daughter’s body. The woman whose daughter has made bad choice after bad choice, who was treated savagely this last month. But then there’s the first-time mom, a woman I knew in her twenties, who glows in every picture she posts. Flowers, chocolates, and sweet cards can’t make up for all the fraught-ness of Mother’s Day. I dread Mother’s Day in church, knowing that for some it’s right up there with Easter and Christmas and for others it’s a day to avoid the worship and sweetness and light. Before I met my husband, when my own hope to become a mother was slipping away, silently and ashamedly, I was leading prayers one Mother’s Day. At the first service, a well-intentioned person asked prayers for all those women who had hoped to become mothers who never did. I felt as though he had shined a klieg light on all that I was trying to suppress that day. I made it through that service, and then collapsed. My good colleagues covered for me, but it was excruciating and humiliating. But maybe in the end it’s because Mother’s Day is really about life, but pinpointed and concentrated. Mother’s Day reminds us of how we’ve been loved in this life. Mother’s Day reminds us of hopes fulfilled and crushed. Mother’s Day magnifies the grief and the joy, the disappointment and the exhaustion. This morning my daughter and I painted the door to our garage. I really wanted to do it by myself, so I could get it right; she really wanted to do it with me, because she loves me and loves to be with me. Seven years into this mother-thing, I have figured that part out. It’s not about being perfect; it’s not about the flowers and chocolate and matching apron and oven mitts that I know are waiting for me tomorrow. It is about the moments, the little moments of squirting paint, and getting out splinters, and shouting and making up. The grief and the disappointment and the frustration lurk around the corner. 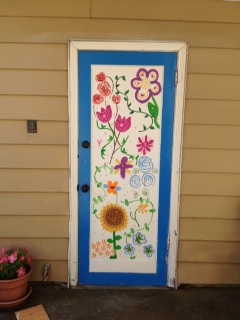 But we got our door painted today, on Saturday, and as far as I’m concerned, I’ve already had a great Mother’s Day. So raise a glass or a mug tomorrow to someone you love – someone who’s here, or someone who’s gone; someone who is your mom or someone who is your hero; someone who’s load is unbearable, or someone who radiates joy in every fiber of his being. Raise a glass to the good, however it comes, and whoever it looks like for you.